I'm just back from Chicago and a work trip, which tends to double as a chance to see my friends and swing by my favorite game shops. The Windy City is where I discovered board games as an adult, and heading back is a big deal for me. I've always got an eye out for games I haven't heard of, so I can try new things and bring them back to my friends at home. Sure enough, Divinare hit the table Saturday night (thanks to Aileen at Wanderer's Refuge for teaching it!) and after a little initial hesitance, I was spellbound. Divinare is a game of drafting cards and making predictions. It's a simple concept turned into a wonderfully fun sequence of choices. In general, players are trying to use their "powers of divination" to determine how many of four types of cards will have been played, in total, at the end of each round. Players take turns playing cards to the board and moving their tokens to claim a predicted finishing total for each type of card. At the end of the round the player who correctly guessed the total number of cards is awarded maximum points, the players who were one card off get fewer points, and players whose guesses were far off lose points. Players who chose not to guess neither win nor lose points. After a number of rounds equal to the number of players, the game is over and the player with the highest cumulative score wins. There are four types of cards (a crystal ball, tea leaves, palm reading, horoscopes), each with a different total (12, 10, 8, 6), that form a deck of 36 cards total. Some cards are removed at random before each round starts, so players don't have perfect information as to how many of each are available, and players are dealt hands from the remaining cards. Some are passed to the left (this happens multiple times in each round, as play progresses), and then players play one card at a time, in turn order, and move their scoring token on the prediction board that matches the card played. There is one prediction board per type of card which contains a space for each numbered prediction, and an additional space for a neutral guess (which awards no points). At the end of the round players count up the total cards at each board and compare the total to their predictions to determine their score for the round. There are a few subtleties that make Divinare more intricate (and more random) than I'd expected when the rules were first explained. First, every time a player plays a card, he or she MUST move the prediction token on that board. Because players must play all cards they're dealt, it's entirely possible (and common) to have to move your token to a prediction you don't want, or to remove your token from a prediction you do want. Most importantly, no player can have the same prediction on the same type of card, so it's very easy to get forced into bad plays if you don't plan carefully. The combination of forced plays and a lack of complete information (because cards are removed at the beginning of the round) creates a vibe that is really complimentary to the theme of the game. There's a great deal of luck involved, but there's also enough planning and "math" (not real math, just card counting) that I found Divinare engaging. My favorite moments in each round were waiting to see which cards I'd be passed, and waiting with clenched teeth to see if, in the last round of play, my opponents would play that one card that would take my prediction from spot-on to a discarded newspaper horoscope. I really enjoyed being forced to make hard decisions about which cards to play (and by consequence, which prediction token to move) based on incomplete information, especially late in each round. I'm hammering this point home - the fact that you HAVE to move your prediction token each time you play a card, and that you can't share a space with another player, leads to some hard decisions in each round that provide most of the tension in the game. 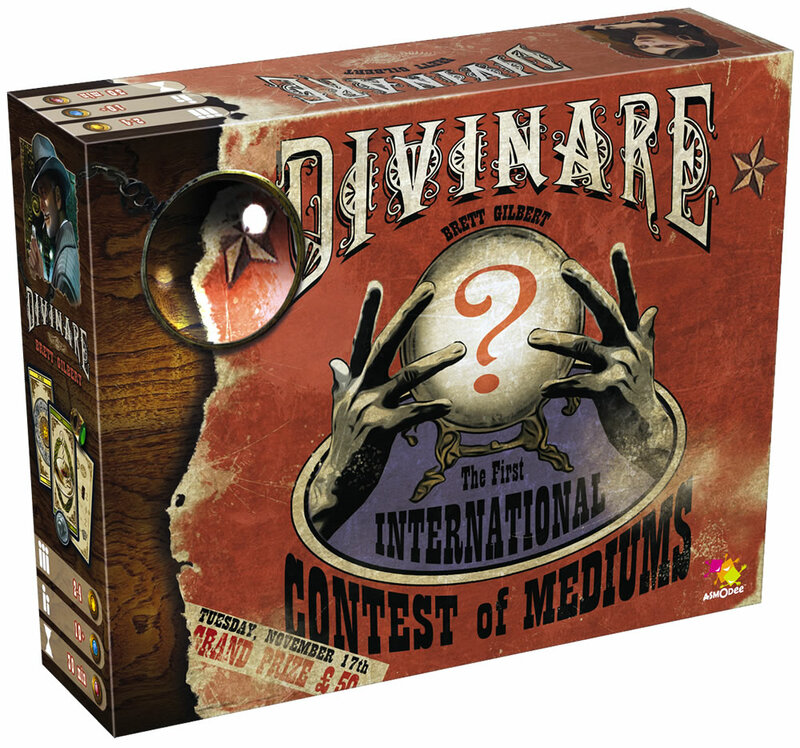 Divinare presents a nice balance of guessing and planning without an overwhelming amount of information or a frustrating lack of it. I was surprised by the simplicity and elegance of the rules, and how they worked together to support the theme of the game. It's basically a game of bidding, drafting, and card-counting, but the combination of those simple mechanics yields something more grand than I'd expected. As a caveat, I only played a four-player game, so I can't speak to the 2- or 3-player variants, but the game does provide rules changes for them, and I assume they're equally enjoyable. Divinare reminded me of 7 Wonders in some ambiguous (and good) way, though I'm not sure there's any link other than the drafting, and the idea that my plays are dictated mostly by the decisions of my neighbors. For an MSRP of $30.00 I think this is a steal - the components and art are very nice, the rules are simple and easy to follow, and it seems like a real breeze to teach. As with many of the games I've reviewed, there's no reading involved for players, so this should be easy for kids to learn and play as well. I picked the game up (obviously) and I'm pretty excited to share it with my play group and at nerd night (our monthly gaming party), so if you see me around, ask me for a psychic reading!